It’s no surprise fundraising professionals look for ways to create efficiencies in their work. As a fundraiser, you get up every day and try to gather more individuals under your banner. With limited hours in a day and a seemingly unlimited demand for funds for your cause, it’s easy to feel overwhelmed in the face of the largest social challenges across the globe. Enter fundraising software, cape furling in the wind. The right software can focus your development team’s attention and allow them to work with a greater number of donors in a shorter amount of time. As such, fundraising professionals everywhere are shopping in the hopes of addressing their similar pain points. 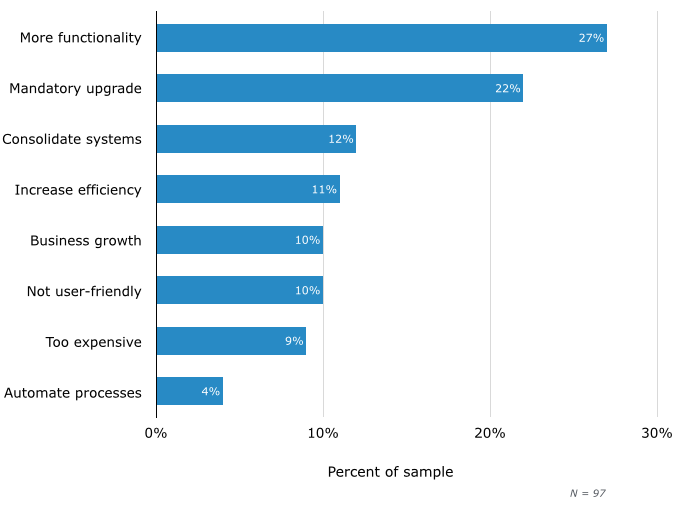 Software Advice, an online resource for software buyers, recently completed a study that identified “wish list” features and current buying trends for nonprofit organizations. Every year, thousands of nonprofits ask Software Advice for help making this buying decision. By analyzing these interactions and sharing their findings, Software Advice aims to help nonprofits make informed buying decisions. In order to complete this study, they randomly selected 200 interactions they had in the nonprofit space in the last year to get a clear sense of why nonprofits were shopping to begin with, and what features they wanted most. Making a buying decision can be a stressful and time consuming process, so for a fundraising professional to take time out of their schedule to shop, you know something must be amuck. These features center almost entirely around enhancing the donor experience. And when used effectively, they increase your odds of securing a donation and retaining a relationship with the giver. 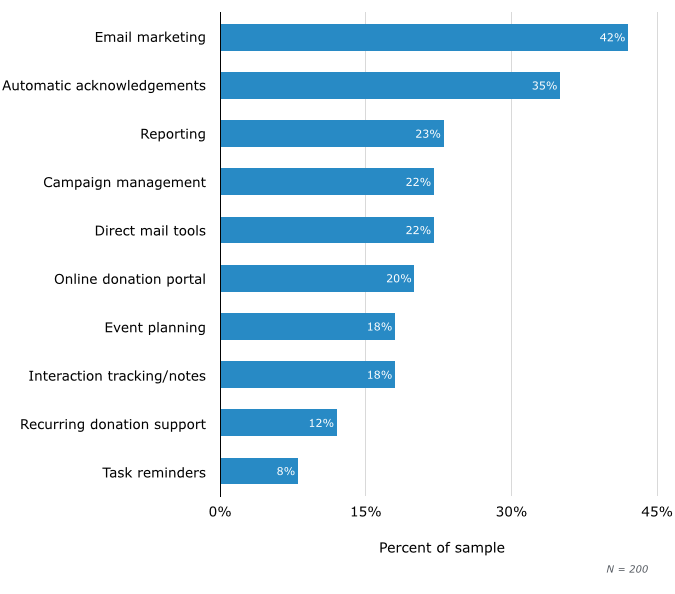 Email marketing, acknowledgements, online donation portals, and direct mail tools all help the fundraising professional in their efforts to form a meaningful connection with the donor. Campaign management and reporting tools help the fundraising professional to analyze donor behavior and monitor and maintain overall campaigns. 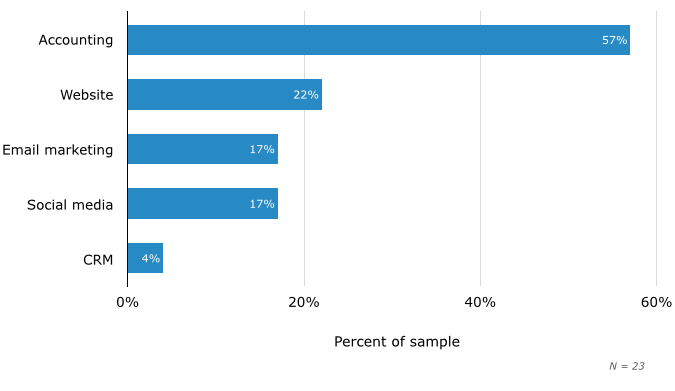 To understand how these top-requested features improve the work of fundraising professionals, Software Advice took a deeper dive into the data. Email marketing functionality specifically, has the highest demand as an individual feature. Just from 2014 to 2015 there was a 133 percent increase in nonprofits seeking fundraising software with email marketing functionalities. This feature is considered a “must-have” for 42 percent of buyers, up from 18 percent last year. By automating elements of the donor stewardship process, fundraising professionals are able to keep touch with hundreds and thousands of donors in much less time. They can send personalized emails and automatic receipts, and communicate with donors more efficiently. These efforts let donors know their contribution was received and appreciated, which helps develop a positive relationship with each donor. Software also helps improve offline communication by offering features that generate lists for time consuming direct mail initiatives such as newsletters and annual reports. With the right software, fundraising professionals can filter their data for specific lists, such as “donors who live in Oklahoma,” and print mailing address labels. Having software tools such as these enhances your communications with donors and allows one professional to do what previously would have required the efforts of several. These communication touch points would not be possible without the ability to store and track donor data, another key feature of fundraising software. In a world without organized and accessible data, it becomes extraordinarily difficult to keep track of donations and communications, leading some donors to feel unappreciated or confused by the incongruent nature of your interactions. Twenty-three percent of shoppers said reporting is a “must-have.” Additionally, 22 percent seek campaign management in their software and 18 percent want donor interaction tracking. Staying up to date on how donors interact with your organization throughout your campaigns allows you to segment your donors and engage on a more personal and relevant level. With all of this data that often comes from different programs and applications, nonprofits need an easy way to integrate the information. When systems are not integrated it can be time consuming to download and upload across different systems. Luckily for buyers, there’s a feature to address this, too. Assess what integrations would have the most powerful implications for your organization in order to best leverage donor data and serve your mission. Software continues to change the way we live and work, and now it’s changing the way we fundraise. An investment in fundraising software is a commitment to a better experience for your donors and to grow the impact of your organization through the new tools at your disposal. Software should empower your operations and inspire your team to always be working toward a better solution to serve your mission.